What’s harder than passing an elephant through the eye of a needle? Choosing a measly SIX pens to ink for the ENTIRE of March! ARRGGHHH! 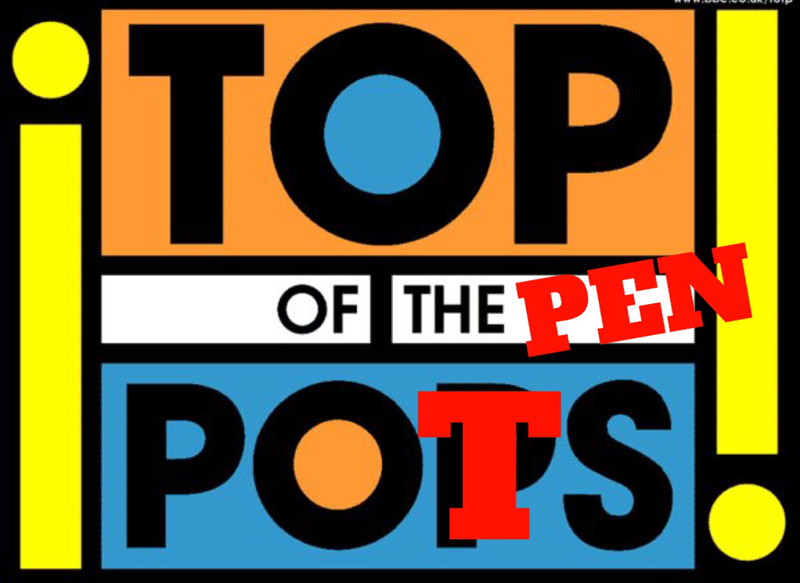 This week’s Top of The Pen Pots goes through my six choices and the rationale (or lack of!) behind them. This pen is a complex swirl of oranges. Diamine Autumn Oak is a shady ink of swirly oranges. Seemed like a logical choice! Plus I’m highlighting course notes a lot at the moment. The Pilot VP has a juicy medium and I wanted to test out the ink brand of the moment in a nib I know well. I chose Emerald as I lack greens in my collection, and I’m determined to understand why Instagram has gone gaga for this company! The Sailor is a new baby in my collection. I bought a broad as the fineness of Sailor’s other nib grades scared me more than my own reflection in the morning (which is A LOT). It’s a smooth, wet writer, and I paired it with the vibrant blue of Akkerman Treves Turquoise to match its Sky blue demonstrator body. I enjoy feeling like I’m splashing in the deep blue sea when writing with all that blue; although seriously, I hadn’t used an Akkerman ink before and needed a good nib to show off all its properties. I don’t need to explain this. Gorgeous pink ink + demonstrator barrel + nib of the gods = Inky idyll. ‘Nuff said. TWSBI’s JoWo fine nibs are renowned for being super smooth, and their piston fillers capable of massive ink capacity. I paired the 580 with Shin Kai for an interesting yet daily writing appropriate combo. I haven’t used this ink before, and am intrigued by its purpley dark blue shading. One old faithful paired with another. The Lamy 2000 is as comfortable to use as my favourite slippers, and Mediterranean blue is a solid, zingy blue for every day use. I hadn’t paired these two together before, but I’m confident this duo will see the most use throughout the month. It seems I’ve juxtaposed a few daily writing inks and pens with more garish colours. I’ve also branched out of my usual ink choices to try new brands and switch up my tired ink rotation. I’ve given up being boring for Lent, obviously ;)! Are you participating in #6penchallenge? What are your pen-ink match ups? Psssst…I’ve cheated a LITTLE bit. I’ve actually inked eight pens: DON’T HURT ME! But, in my defence, the other two are new acquisitions that I intend to review soon. Stay tuned! You have the same pens as me except for the persimmon swirl. Have been umming and ahhing about that one! Richard, do it! It’s a great writer, wonderful in hand and looks gorgeous!